Blinds within double glazed units are totally encapsulated within the glazed unit. They provide a great concept for solar shading and are extremely versatile in their use. They do make an enormous contribution to the comfort of any room that gets a lot of sunshine. In addition, they make a direct contribution to the energy efficiency of a building. 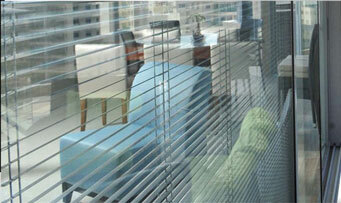 Blinds within double glazed unit consist of Venetian blinds permanently sealed within a double glazing unit. They are suitable for all vertical window applications and provide an ideal solution for conservatory shading. 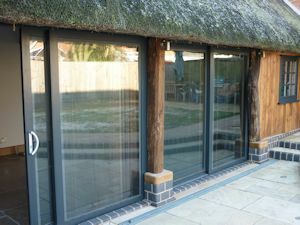 They provide total privacy and light control when used in bifold doors. Within a office environment, they allow excellent utilisation of a partitioned office space. Sunshade Blinds utilise a highly innovative system offering many beneﬁts. They are not only aesthetically pleasing, but also very practical. This has made them the preferred choice of style-conscious home owners. Blinds within double glazed units can be used for both domestic and commercial installations and are very suitable for bi-folding doors and windows. Our blinds within double glazed units are manufactured to the highest standards and speciﬁcations. Once sealed in the dust-free environment of the glazing cavity the blinds will need no cleaning, will always appear new and are protected from damage. There are no mechanical parts to break, so having Blinds within double glazed units makes them virtually maintenance free. The encapsulation of the blinds in the double glazing provides complete protection against dirt, dust or weather conditions. The movement of the blind can be managed both manually or using a motorised solution to great effect. Another great feature is that having the blinds within double glazed units does not compromise the insulating properties of the double glazed unit.